Lucy claims the Disappearing Four Patch to be her quilt of choice. Earlier this summer I took a class at Sewing Arts Center in Santa Monica with Susanne Cole. It was a variation of the Disappearing Four Patch. 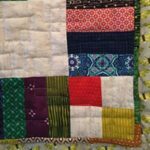 The class was a lot of fun and in the end I used over 90 different fabrics for this quilt, with each square having four different colors and they were not repeated in other blocks. 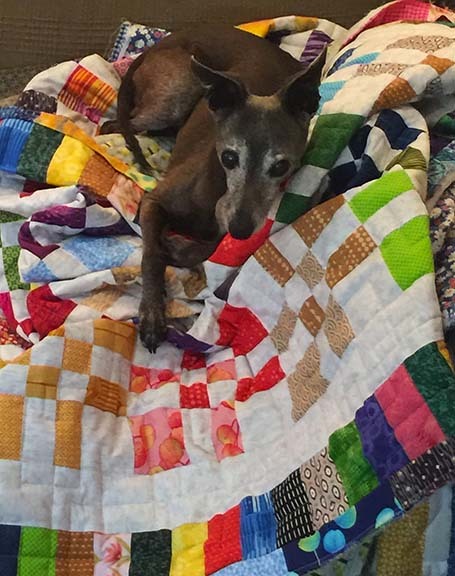 As you can see, Lucy claimed this quilt earlier on in the process. While I was sewing the binding by hand she was laying on the quilt and each time I moved the quilt she would get right back on it. For those of you that have four legged kids- you know that they always get their way! I was very happy with how the quilt turned out. The white background help to give the eyes a bit of a rest from all of the colors that were used. Disappearing Four Patch with 96 different colors. 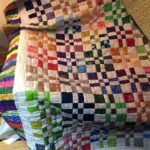 The border was completed with a piano key pattern, using all 96 colors again. Detail of the corners of the quilt, along with the piano key border and hand stitched binding. Catherine Moore on Oh Delilah! Lisa Annenberg/Baldwin aka Rarebird lisa on Don’t Be Pickin’ Ms Daisy’s Flowers! JeanneMarie on Don’t Be Pickin’ Ms Daisy’s Flowers!